I love an ultrawide monitor, and I’m rather partial to G-Sync screens with high refresh rates too. So AOC’s AGON AG352UCG6 should be right up my street… however much I might struggle with the typically awkward naming schemes AOC previous used for its AGON screens. But, while it does indeed tick a lot of my gaming monitor boxes, it doesn’t quite do enough to justify its $890 (£801) price tag. There’s a lot to like about the monitor itself, and the AGON feature set, but there is something which feels a little average about the actual panel AOC has dropped into the updated AGON AG352UCG6. Check out our pick of the best ultrawide gaming monitors. 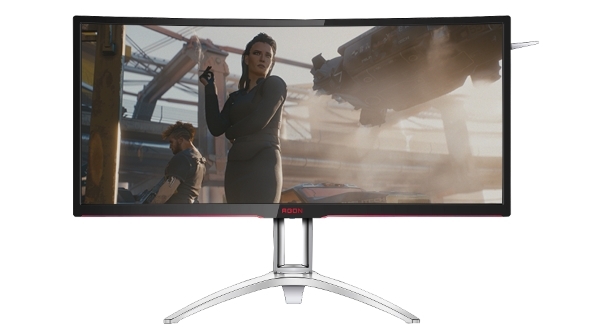 I checked out the previous version of the screen just over a year ago, and the straight AOC AGON AG352UCG was one of my favourite ultrawide screens of last year. AOC has updated the specs sheet of the new AGON variant, and for the most part it’s an improvement, but while other panels are producing genuinely vibrant visuals there’s something that feels a little faded about this latest display. At its most basic the AGON AG352UCG6 is a 120Hz, 35-inch ultrawide G-Sync gaming monitor with a 3440 x 1440 native resolution. As I said, that ticks a lot of the right boxes – G-Sync should enable the high refresh rate to deliver a super smooth gaming experience and the 1,440 pixel high res means there’s enough vertical space to make it a great display for desktop work too. The previous version had more or less the same specs, but its VA panel was limited to 100Hz. This screen is still using VA technology, but is capable of being driven at up to 120Hz, and you should be able to see the difference in-game. The newer AG352UCG6 also has a higher contrast ratio of 2500:1 compared with the 2000:1 spec of the last-gen panel. It retains the same 1800R curvature, though, giving it the same gentle, sweeping curve across its 35-inches of screen real estate. But that’s really the only differences on the specs sheet, so how does it actually perform when you’re actually looking at the screen and not the tech specs? Fine. There are some things I am really impressed with regarding the panel – that improved contrast really is excellent, with a clear delineation of colour at both the darkest and lightest ends of the colour range. There’s no visible banding on display either, allowing a smooth gradient between different shades and tones. Despite the impressive contrast, and the fact it’s using a VA panel, the black levels are only okay. They’re not great, but they’re not Asus PG27UQ bad either. The white saturation is pretty good, though. What I don’t love about this AGON screen, however, is the motion I’m getting with the combination of 120Hz refresh rate and G-Sync. Plugged into an MSI GTX 1080 Ti Gaming X Trio my test rig has the power to drive almost anything I can throw at the AGON’s 3440 x 1440 resolution, but there’s something that feels a little gritty about the movement in-game. I’m used to G-Sync delivering a really smooth experience, and while it’s certainly not VSync stuttering levels, it’s not quite perfect either. I don’t recall having the same feeling with the 100Hz refresh rate of the previous version of this ultrawide AGON. Possibly because my standard office monitor is an IPS Dell professional screen, the visuals look a little faded at the screen’s default settings. You can alleviate much of that, and make the image more vibrant through the panel’s on-screen display, but it did take a little playing around to get the VA display looking as good as I know the technology can. 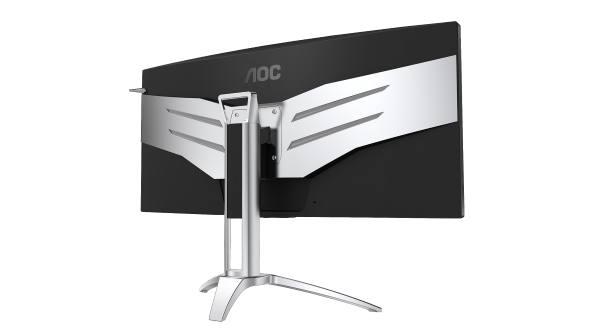 Though, as a whole, I’m not really going to miss having the latest AGON ultrawide on my desk because of its panel, I’ve still got a soft spot for the AOC design. True, there is still a rather chunky plastic bezel surrounding the display, but I feel bereft at not having the simple headphone hook sticking out of the side of my current monitor. It’s a little thing, but shows that AOC does know PC users and our various needs. 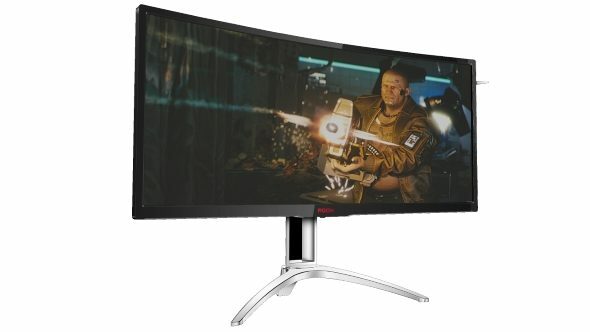 While I might be sounding a little negative about the AGON AG352UCG6 it’s not a bad gaming monitor, it’s just that considering it’s still $890 (£801) I want to fall in love with the visuals of a monitor I’m going to spend that much cash on. And on that front I’d still rather get the Asus ROG Swift PG348Q or BenQ EX3501R.